Disclosure: I received this CD in exchange for my honest review. All thoughts and opinions are my own. Have you heard any of the songs from The Afters newest CD? 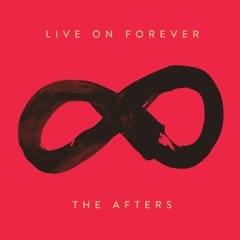 It's titled Live On Forever and the music is engaging, toe-tapping and shower sing along worthy. I hadn't read all the information about the CD before listening to it. I wanted to listen on my own and not be swayed by the cover blurbs. But the song 'Battles' spoke to me so strongly in my current season of life. I've had a big transition summer with my oldest going to college and my younger two moving from middle to high school and elementary to middle school. With change, there's a lot of adjustments and sometimes, battles to make sure my son's special needs are taken into account. I sometimes get bogged down in the idea that my battles are hard and I can't go on. Time after time you're my refuge,You heal every scar you're guarding my heart.Your promise, the hope that I cling to,My rescue, my friend you come rushing in. I knew God was speaking to me. You can watch the video below and hear for yourself. After listening, I then read the information about the album. It's incredible. Would you like the opportunity to win a copy of the CD for yourself? Enter below using the Giveaway Tools form. Good luck!